The Melon Ball is usually prepared as a delicious, fruity vodka shooter. The uniqueness of this shot is the melon liqueur. If you are looking for a decent melon liqueur to work with, Midori is a good choice. In the expansive choice of shooters, this is one of the better tasting that has a hard vodka base but is a little more mellow than some of the others. Note that when mixing these up in any kind of bar setting, you want to make at least a couple of these at a time. These are very cost-effective shots for the house and having them on special for the night can make the bar a whole lot of money. You can also take this recipe and strain it into a cocktail glass or build it into a tall mixed drink. 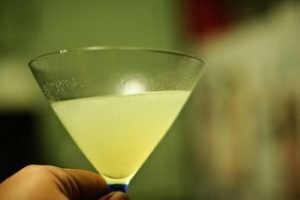 As a fancy martini, the same ingredients are used as in the Melon Ball Shooter recipe. We want the honeydew flavour from the melon liqueur to balance of the tartness of pineapple juice. We also want to add a bit more Vodka to the mix to make this a sipping cocktail.